PLO Secretary General: Romania plan to relocate embassy to Jerusalem a blatant violation of Palestinian rights. 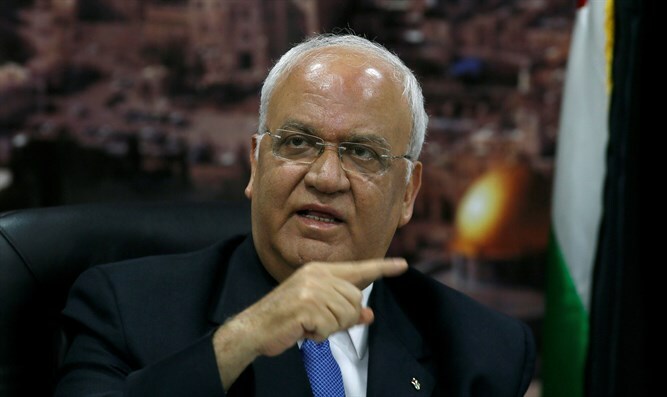 Palestine Liberation Organization (PLO) Secretary General Saeb Erekat on Sunday blasted Romania’s announcement that it will relocate its embassy in Israel to Jerusalem, calling it "a blatant violation of Palestinian rights, international law, and UN resolutions". Erekat said Romania’s move "only contributes to eliminating the two-state solution", according to AFP. He called on the European Union to take action over the decision and said the matter would be raised with the Arab League and the Organization of Islamic Cooperation. Earlier on Sunday, Romanian Prime Minister Viorica Dăncilă announced plans to relocate her nation’s embassy in Israel from Tel Aviv to Jerusalem. Speaking at the annual AIPAC conference in Washington, DC, the Romanian premier said, "I am pleased to announce today, in front of this AIPAC audience...I as Prime Minster of Romania, and the government that I run, will move our embassy to Jerusalem, the capital of the State of Israel." "I can promise you this: Romania will remain the same loyal friend and the strongest European voice in support of the Jewish people and the State of Israel," she added. Dăncilă’s announcement, however, raised the ire of Romanian President Klaus Iohannis, who said later Sunday that he would not permit Dăncilă’s government to relocate the embassy. "The final decision about moving the embassy from Tel Aviv to Jerusalem rests with me. The prime minister shows complete ignorance regarding foreign affairs,” he said. Dăncilă later said, however, that the government does not have the support it needs to implement the plan. Iohannis subsequently called for Dăncilă to resign over the planned embassy relocation, saying he is opposed to the move and was not informed beforehand.